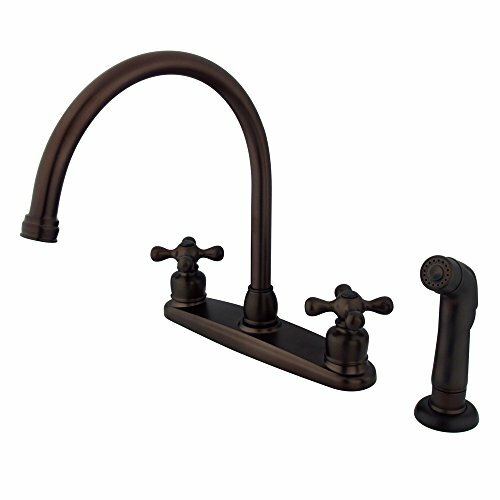 Descriptions:This double handle kitchen faucet personifies the elegance of the early traditional American design. The faucet features an 8" centerset platform with a high goose neck spout that rotates 360 degrees for accessibility and convenience. The body of the faucet is constructed in solid brass for durability and long-lasting usage with the finish made from oil-rubbed bronze for corrosion and tarnishing resistance. The handle levers feature a 1/4-turn on/off mechanism for controlling water volume and temperature. The faucet operates with a washerless disc valve for drip-free functionality and has a 2.2 GPM (8.3 LPM) and a 60 PSI maximum rate. An integrated removable aerator is fitted beneath the spout's head piece for conserving water flow. A 10-year limited warranty is provided to the original customer. Non-metallic sprayer included.